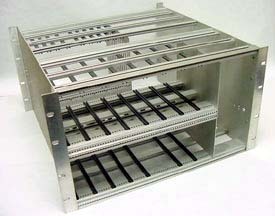 Sub-Rack Card Cages and Chassis - Equipto Electronics, Corp.
Our sub-racks are custom manufactured to meet your particular electronic enclosure requirements. Our wide experience with VME, CPCI and other standards allow you to receive a custom enclosure that easily accommodates standard electronics. Off the shelf card cages and chassis may not be the best solution for your innovative designs. Equipto Electronics can engineer and build the right package to your exact requirements. Whatever you need — custom length, width, depth or spacing — an Equipto Electronics packaging solution will complement your design, not compromise it. Special front panels, unique finishes, custom labeling or your logo can be applied during manufacturing, saving you time. We can create the package you want from your drawings, rough sketches, even conversations. Our emphasis on quality and timely delivery ensure you get what you want when you want it. Our 25 years of packaging experience includes all industry standards such as EIA, VME, VXI and Compact PCI. Whether your application is telecom, automated testing, or industrial automation, we can get you to market quickly and cost effectively. Let our technical staff help you from prototype to production. And as a leading manufacturer of electronics cabinets, we can even help you package your entire project in the industry’s best engineered, best built electronic enclosures and racks. Our sub-racks feature two main types of construction: aluminum extrusion or sheet metal based. Extrusion based sub-racks offer rigid construction and a high strength to weight ratio. Sheet metal sub-racks are available in either aluminum or steel and allow for a high degree of customization. Several varieties of card guides are available. In metal guides are formed directly in the material and offer light weight and low cost. They are available with or without a PCB “lead in.” The lead in helps guide the boards into the correct position as they are inserted. Plastic card guides are available in both English and metric dimensions. Anti-vibration versions are available. This style features a small finger of plastic that helps grip the board and limit vibration. All plastic guides have a 94V-O flammability rating for regulatory compliance. Custom front panels are available for any sub-rack. Total customization is available including cutouts, hardware, custom paint, finishing and silk screened labeling. Your sub-rack can be finished in variety of ways. From various anodized finished for aluminum chassis, to color matching in both wet and powder paint, we can deliver your chassis with the finish you require. A wide variety of other features are available including chassis handles, wire management features, ventilation and shielding. Contact us at 800-204-RACK (7225) to design your custom sub-rack.